Hello. 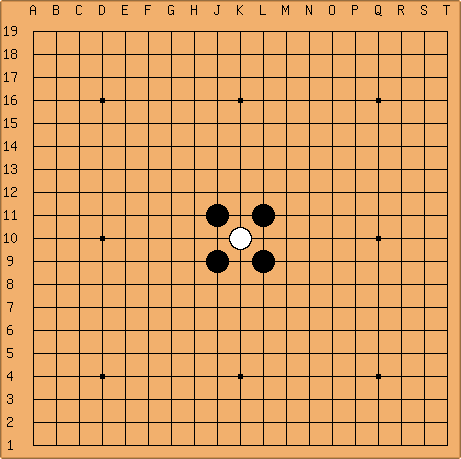 I am "rakushou" on KGS. I also have a gobase account. I used my KGS rank information in addition to just "Registration" in the subject line of the email needed to secure an account. Double-Convex, 9.2mm (x) 21mm yunzi stones, with jujube gloss finish bowls, and carrying bag, also from Yellow Mountain Imports. The cardboard set that seems to be called "Go, a Game of Oriental Stategy"
The equipment that comes with The Go Book, which I consider my first Go set. While looking at Kyu Exercise 4, I caught a blind spot at S1. This problem seemed too easy to be a kyu exercise. 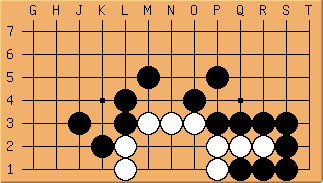 So, without further ado, where did my blind spot lead me to play (which was wrong for Kyu Exercise 4, of course)? I think I saw this problem at goproblems.com. An advertisement on this site's sidebar reminded me of it. Several Beginner Exercise attempts or solutions. Note: This list does not include the solution pages to my Go problems. Black & White are the Pages of the Month for February 2005! As someone who has used Sensei's Library for long enough to be more than comfortable with editing pages and one who has explored this Wiki enough to take note of what conventions I like and which ones I don't like, I feel that I can make informed, logical, sincere, and respectful complaints about certain aspects of SL. I like the convention on the pages with problems and/or exercises of having the setup for the problem on one page that is linked to the page with the solutions, which is a separate page. My complaint arises with regards to the series of problems known as Tsumego From Games. A few to several of the problems belonging to this series have everything, which includes the setup, the attempts, analysis, and the solution, all on one page. I don't like this style from both an aesthetic viewpoint and practical/sensible perspective. Having this style would not be too bad in and of itself, although I would still not like it, but the fact that there are two different styles by which Go problems are presented causes confusion and distaste. In fact, if we are to talk about it in terms of personal taste, I do have problems with the all-on-one-page format for Go problems. It provides too much of a lure for my curiosity factor to be able to solve to problem in a functional way. It also feels very cluttered, whereas the format that has the problem on one page, and you must click the link to see the solution (or the hints, attempts, or analysis), is clean, elegant, and on point. Realization, more than 3 years coming: The background design of SL is supposed to be reminiscent of a traditional shell white Go stone.